The Huddy Park In-Water Boat Show is “FREE” with “FREE BOAT RIDES”! The Huddy Park In-Water Boat Show is a family oriented boat show located in Downtown Toms River in beautiful Huddy Park. The show is twice a year. Once in the Fall and once in the Spring each year. Times and Dates are subject to change each season…..so always check. 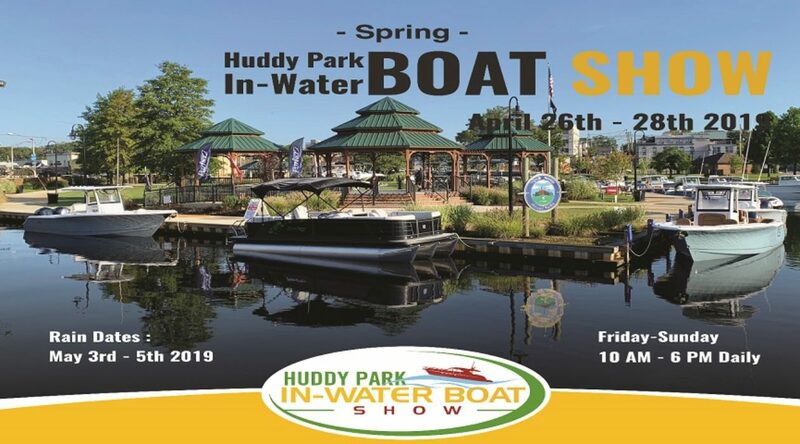 The Huddy Park In-Water Boat Show is FREE with FREE BOAT RIDES! There are many boats in the water for sea trials as well as boats on land. There are also vendors and other activity area’s depending on time of year and participation. There will be Regular, Luxury and Performance Triple Toon Pontoons with 150’s, 200’s, and 300 Horse Power. Also, Deck Boats, Center Console Fishing Boats, Dual Console Fishing Boats and Pilot House Fishing Boats. Click Here for Smartphone and Google Map Directions! 5TH ANNUAL HUDDY BOAT SHOW CHANGED FOR RAIN! "The Only Boat Show In New Jersey That You Can Actually Ride A Boat"